ROUSSEAUX ST JOHN, JOHN BAPTIST (baptized Jean-Baptiste Rousseau, dit Saint-Jean), fur trader, interpreter, businessman, militia officer, and office holder; b. 4 July 1758 in the parish of La Visitation du Sault-au-Récollet (Montreal, Que. ), son of Jean-Bonaventure Rousseau, dit Saint-Jean, and Marie-Reine Brunet; d. 16 Nov. 1812 in Niagara (Niagara-on-the-Lake), Upper Canada. Some 20 years before the formation of Upper Canada the Rousseau family of Montreal launched its commercial activities in the Toronto area. In the fall of 1770 Jean-Bonaventure, an interpreter with the Indian Department, was licensed to trade at the Toronto (Humber) River with the local Indians. He transmitted his linguistic skills to his son Jean-Baptiste, who later put them to good use when lie in turn joined the department in 1775, on the eve of the American revolution. 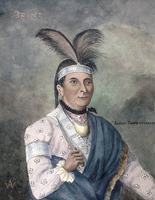 During the subsequent campaigning he may have served with Luc de La Corne* and probably met Joseph Brant [Thayendanegea], the influential Mohawk chief. On 14 July 1780 Rousseaux married Marie Martineau (Martineaut) at Montreal. In 1783 they reportedly moved to Cataraqui (Kingston, Ont. ), where for a few years Rousseaux spent the winter months after lengthy stints of trading at the mouth of the Toronto River, his father’s old stamping-ground, and interpreting for the Indian Department. Presumably this erratic life contributed to the breakup of his marriage, which ended in the summer of 1786 after his wife “in her blindness” became involved with another man. Within a year he took a second wife, Margaret Clyne (Cline, Klein), “formerly a prisoner among the Mohock Indians,” who had been adopted by Brant. Brant placed a high value on Rousseaux’s judgement and ability, and this union strengthened their relationship. On two subsequent occasions the couple renewed their vows before the Church of England clergyman Robert Addison*: first at Brant’s home on the Grand River on 15 Oct. 1795 and secondly at Niagara on 30 June 1807. Although Rousseaux’s first marriage had been childless, the second produced six children including a son named Joseph Brant. In the late 1780s Rousseaux was still trading at the Bay of Quinte and “the regions thereabout,” the latter doubtless including the Toronto area. When the first surveying party passed along the north shore of Lake Ontario in 1791 it was greeted at Toronto by “Mr. St. John,” as he had come to be known locally. That same year he began trading with the Six Nations and built a corn mill near the present site of Brantford. Apparently a year later, after he had been joined by his wife and family, he took up year-round residence on a 500-acre tract on the east bank of the Humber. By 1792 Rousseaux was established as a shopkeeper, probably the first in what shortly became the town of York (Toronto). 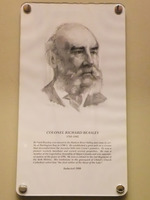 As a fur trader and general merchant, he entered partnership with Thomas Barry in 1794, and they soon became regular customers of Richard Cartwright, the prominent Kingston merchant who supplied most western traders. Rousseaux also continued as an interpreter. On 24 July 1793 Lieutenant Governor Simcoe urged that he be appointed his personal interpreter. Rousseaux had, Simcoe wrote to Alured Clarke*, the lieutenant governor of Lower Canada, “all the requisites necessary for that office, and is equally agreeable to . . . [Brant] and the Mohawks as to the Missassagas . 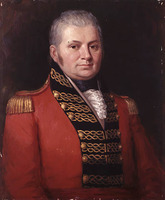 . . the only person, who possesses any great degree of influence with either of those Nations.” Yet once that year Rousseaux had refused to assist Simcoe “on account of the impracticability of quitting his mercantile business for so long a season.” However, he did serve during a council called at the Humber for 26 Aug. 1793. In 1795, in part because he had been refused additional land on the Humber, Rousseaux decamped with his family to the Head of the Lake (the vicinity of present-day Hamilton Harbour) and settled in Ancaster Township. He had prepared the way on 5 Oct. 1794 by purchasing from James Wilson his half share of a grist-mill and sawmill owned by Wilson and Richard Beasley*. In 1797 Rousseaux bought out Beasley’s share. Building on his York experience, he opened a general store and entered into a brisk trade with Brant’s Mohawks and other Six Nations customers from the Grand River. He opened an inn and a blacksmith shop and over the years amassed considerable landed property. In 1796, in collaboration with Wilson and Beasley, he purchased block 2 of the Six Nations’ lands, comprising some 94,000 acres. This sale and others were ratified by the government on 5 Feb. 1798. Shortly thereafter Beasley bought out his partners’ interests. Rousseaux’s business activities in this period may have been partly financed by a £1,000 bond dated 20 June 1798 from Brant acting on behalf of the Six Nations. 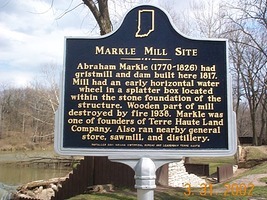 On 4 May 1809 Rousseaux sold his mills to the Union Mill Company, whose shareholders, including Abraham Markle*, may have been operating them as early as 1806. Rousseaux had become a man of parts and he was appointed the township’s tax collector. 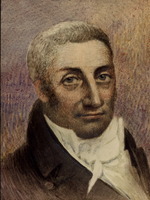 Moreover, this son of old Quebec, who had once affirmed that he was a faithful member of the “Apostolic and Roman Church,” became a freemason on 31 Jan. 1796 in the newly formed Barton Lodge. He continued as an interpreter and adviser on Indian affairs, not always, it would appear, to the satisfaction of his superiors. Although Administrator Peter Russell often appreciated his services, he sometimes thought that Rousseaux was interfering with the government’s Indian policy. On one occasion in 1798 Russell accused him of trying to block a scheme to curb Brant’s power for fear it might threaten the miller’s own commercial interests. In spite of these squalls, however, Rousseaux was retained by the Indian Department, and he came to play an active role in the colony’s militia establishment as well. On 24 June 1797 Robert Hamilton, lieutenant of the county of Lincoln, appointed him an ensign in the militia. 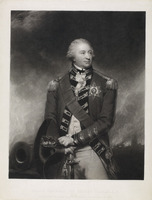 He was commissioned captain on 15 July 1799 in the West Riding Militia of York and on 16 May 1811 he was promoted lieutenant-colonel in the 2nd York Militia. The following year he was appointed captain in the Indian Department. On the eve of hostilities with the United States, in early June 1812, he reported to William Claus*, deputy superintendent general of Indian affairs, on activities at Grand River of Senecas from New York. They had been sent by the famous chief Red Jacket [Sagoyewatha*] to urge the neutrality of the Six Nations. Rousseaux was present at the battle of Queenston Heights on 13 Oct. 1812. He died of pleurisy on 16 November while visiting Fort George (Niagara-on-the-Lake) and was buried with full military honours in St Mark’s churchyard at Niagara. He left his estate to his wife, to William Crooks, brother of James*, and to Markle. Aside from his Ancaster properties Rousseaux’s estate included 500 acres in Barton Township, 400 acres in Oxford (East and West Oxford) Township, and 200 acres in Beverley Township. He had 69 outstanding accounts totalling in excess of £1,170 and owed £1,151 12s. 1d. His principal creditors were the Crooks brothers, merchants at Niagara, to whom he was in debt for £312 5s., and the Montreal firm of Auldjo and Maitland, which was owed £555 17s. 10d. Rousseaux made a significant contribution to Indian affairs and to the development of early York and Ancaster. He was also a visible bridge between two régimes, the one French and geared to the ancient fur trade, the other British and responsive to the needs of more varied commercial enterprises and, above all, to the demands of a colony of settlement. AO, MU 2554–55; RG 22, ser.155, will of J.-B. Rousseaux. MTL, D. W. Smith papers, 137: 227–37; Alexander Wood papers, business letterbooks, I: 7–8 (Wood to R. and S. Hatt, 15 May 1801). PAC, MG 19, F1, 10: 87ff. ; RG 1, E3, 7: 9a–c; 68: 206–18; L3, 204: G5/65; 422A: R1/20, 27; RG 5, A1: 15999–6000; RG 10, A2, 27: 511ff. ; RG 19, 3741, claim 73. PRO, CO 42/321: 35–36. Canada, Indian treaties and surrenders . . . [1680–1906] (3v., Ottawa, 1891–1912; repr. Toronto, 1971), 1: 27. Corr. Of Hon. Peter Russell (Cruikshank and Hunter), 2: 53, 187, 272, 310–11. Corr. Of Lieut. Governor Simcoe (Cruikshank), 1: 396; 5: 70, 79, 111, 226. [E. P. Gwillim (Simcoe)], Mrs. Simcoe’s diary, ed. M. Q. Innis (Toronto and New York, 1965), 101, 106. “Surveyors’ letters, etc.,” AO Report, 1905: 472. Town of York, 1793–1815 (Firth), 1v, lvii, 7–8, 109–12, 212, 215. “U. C. land book C,” AO Report, 1931: 32. Valley of Six Nations, 97, 129–30, 139, 142, 154–55, 160–61. Illustrated historical atlas of the county of Wentworth, Ont. (Toronto, 1875; repr. Dundas, Ont., 1971), iv, viii, 38–39. W. H. Smith, Canada: past, present and future . . . (2v., Toronto, ; repr. Belleville, Ont., 1973–74), 1: 170, 229. Ancaster’s heritage: a history of Ancaster Township (Ancaster, Ont., 1973), 25, 27–28. Historical sketch of the Barton Lodge No.6, G.R.C., A.F. and A.M. (Hamilton, Ont., 1895), 183. C. M. Johnston, Brant County: a history. 1784–1945 (Toronto, 1967). K. M. Lizars, The valley of the Humber, 1615–1913 (Toronto, 1913), 36–48. Norman Macdonald, The Barton Lodge, A.F. and A.M., No.6, G.R.C., 1795–1945 (Toronto, ), 39–40. P. J. Robinson, Toronto during the French régime . . . (2nd ed., Toronto, 1965), 209–20. Charles M. Johnston, “ROUSSEAUX ST JOHN, JOHN BAPTIST,” in Dictionary of Canadian Biography, vol. 5, University of Toronto/Université Laval, 2003–, accessed April 24, 2019, http://www.biographi.ca/en/bio/rousseaux_st_john_john_baptist_5E.html.